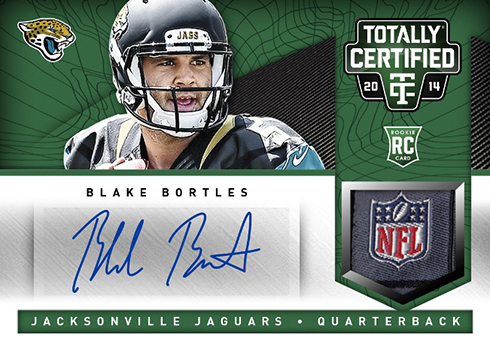 2014 Panini Totally Certified Football arrives with a somewhat different look but with a lot of the same trademarks. The distinct etched foil design anchors the products, which also includes an autograph or memorabilia card per pack. The base set includes plenty of color thanks to the many parallels, both Platinum and Mirror Platinum. These include rookies, which land one per pack as either a base version or a parallel. Platinum parallels include Platinum Red (#/100), Platinum Blue (#/50), Platinum Gold (#/25), Platinum Green (#/5) and Platinum Black (1/1). Mirror Platinum levels come with Mirror Platinum Red (#/25 or less), Mirror Platinum Blue (#/10 or less), Mirror Platinum Gold (#/5 or less) and Mirror Platinum Green (1/1). Rookie Autographs stick with the rainbow mix. Levels include Red (#/100 or less), Platinum Blue (#/50 or less), Platinum Gold(#/25 or less), Mirror Red (#/25 or less), Mirror Blue (#/10 or less), Mirror Gold (#/5 or less), Platinum Green Tag (#/5 or less), Platinum Black Tag Nike Swoosh (1/1), and Mirror Green Tag (1/1). 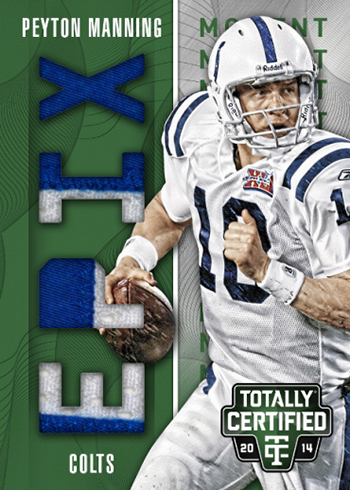 Epix is a memorabilia set that uses multiple tiers, much like the original inserts from the late 1990s. Red Play are the most common followed by Blue Game (#/50 or less), Gold Season (#/25 or less) and Green Moment (#/5 or less). 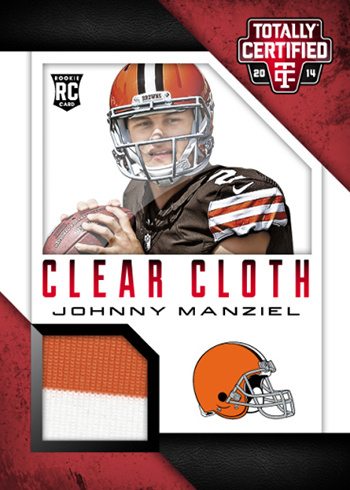 Clear Cloth memorabilia cards, which have been done in several sports, combine an acetate design and a player-worn swatch. They're numbered to 100 or less. *Card 187,195 are only available as parallels. For exact print runs, see the Excel spreadsheet here. For exact print runs, see the Excel spreadsheet here. Is that really all there is to it? No other inserts? Just the Epix, Clear Cloth, Rookie AUTOs, and parallels. Not much to hunt for here it seems. I will be back to rate the cards when I see them. Breakdown is 2 autos and 2 patch cards. We opened 1/2 a case and did not see any deviation. We took part in 2 case breaks and did not see much variance between the hits from our boxes and the case break. Both instances had 1 emerald 1/1 rookie auto per case. Thank goodness the fluff Thanksgiving set is gone this year! The lower price point is nice to have BUT you still do not get your money back with this reduced product. With the reduction to 4 packs, set chasing will be extremely costly to achieve. The base auto set is weak and outdated. Michael Sam was cut from the Cowboys Practice squad but still had a card here?!? Seastrunk didn’t make the 53 man roster in Washington before the season but still has a rookie auto in a mid-season release?!? No star skill position players i.e. 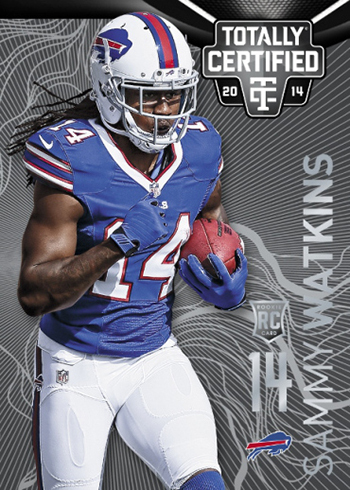 Kelvin Benjamin, Sammy Watkins, Mike Evans etc… Star skill players were part of the base checklist in the 2013 series so why not this year? Please return it back to the 6 hit format of last year! AND add the skill position players back into the auto base set. The base design is cool and it makes the Gold /25 parallels pretty cool. Nothing to shake a stick at. Could be a nice Xmas gift at $60 a box or less by then. We purchased many boxes of this on black friday and I can say we will never get it again. The last box we opened had 11 doubles. Yes. 20 cards and over half of them were identical. In the 5 or so boxes we’ve opened none if the hits were that spectacular. Very very disappointing. I just don’t understand the complaints. This is a CHEAP product with 4 hits. If you chase hits I don’t see how you can go wrong. this is basically the same price range as Bowman Chrome which is only 1 guaranteed hit, and is in the same price range. 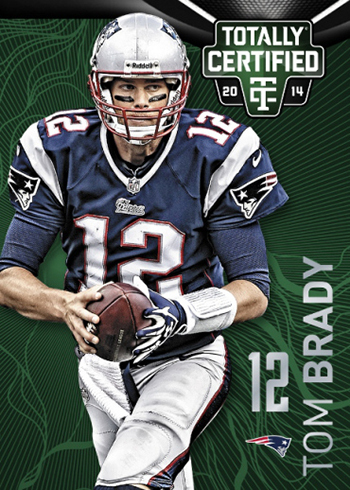 Yes you are guaranteed a pulsar refractor but most of the time it’s a vet and is worthless in the hobby, unless it’s manning or brady. I personally have had great success with this product, the first box I opened had a #1/10 Gold auto rc. And why complain about the checklist? Bowman’s checklist is bigger I would think and only has 1 hit. Out of 7 boxes I have only received 1 auto of a vet. have received 1st round offensive player’s jersey patch autos numbered to 25. Yes it isn’t as great as it use to be, but all 2014 products are more expensive than 2013 products (at least at the store I buy from) and the 2013 is double the price, and really is there anyone out there that would take 1 box of 2013 over 2 of 2014? Your chances of getting a decent rookie from 2013 are extremely small considering that the draft class wasn’t great and anyone who showed promise either flopped or was put on IR in the preseason. 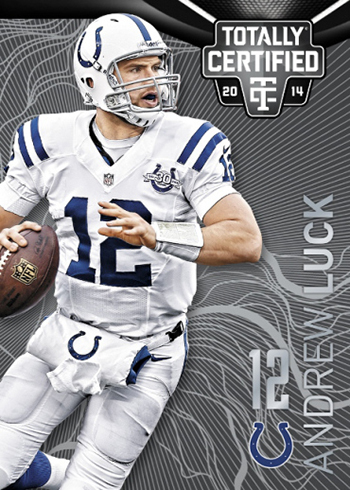 Geno autos were going for 100s in early 2014, your lucky to get a buyer now. Personally I don’t think it’s the greatest product, but I don’t understand the complaints, as the good old saying goes, you get what you pay for, 4 hits for 60 bucks? Name another product NFLPA and NFL approved where you get 4 hits for 60 buck’s backed by a brand like Panini. Overall maybe I am Bias because I have had nothing success with it. BUT I have had some horrible boxes and if your are unlucky to get one of those as your first then I would understand why you may not like it. Thought I would buy a box of 2014 & two packs bc I had no luck w two boxes of 2012, maybe this yr would be different. This isn’t a bad product for the price & the design is cool. Might as well get em now awhile the price is low before the price shoots up like the 12’s bc of the class. Ok, here’s what I pulled… A base of K. Benji,#/50 Plat. blue C. Shorts, #/50 RRCJ K. Carey, #/25 CF Prime Gold J. Houston, #/5 EPGM D. Brees, & #/1 AA Green J. Kerley. Did I get lucky?? Hell yeah I did…Happy hunting everyone! 2014 Panini Totally Certified Football Hobby Box Garoppolo RC AUTO. ?